Devastated by the demolition of their last hope, Ember and Chase follow the only thing left to them--tracks leading away from the wreckage. The only sign that there may have been survivors. With their high profile, they know they can't stay out in the open for long. They take shelter in the wilderness and amidst the ruins of abandoned cities as they follow the tracks down the coast, eventually finding refugees from the destroyed safe house. Among them is someone from Chase's past--someone he never thought he'd see again. Banding together, they search for a place to hide, aiming for a settlement a few of them have heard about...a settlement that is rumored to house the nebulous organization known as Three. The very group that has provided Ember with a tiny ray of hope ever since she was first forced on the run. 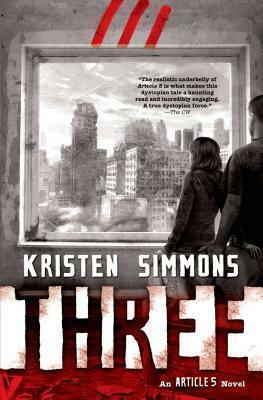 "Kristen Simmons' Article 5 is a gripping, atmospheric story of survival. Alongside a fierce depiction of oppressive government, Simmons has created a bleak portrait of an America lost. I could hardly put it down. Ember Miller and Chase Jennings can be my post-apocalyptic wingmen anytime." --Kendare Blake The new world imagined here is legitimately terrifying. [T]he chemistry between Chase and Ember is excellent, and the plentiful action, high stakes, and deliciously angst-laden love story will please readers. "Bulletin of the Center for Children's Books"
Paints a picture of a world that could easily be our future. [Simmons'] fluid writing creates an easy-to-read story that opens the eyes of readers to what the loss of civil liberties could entail. This book is a must have for all young adult collections. "VOYA"
Kristen Simmons has a master's degree in social work and is an advocate for mental health. She lives with her husband, Jason, and their precious greyhound Rudy in Cincinnati, Ohio. She is the author of Article 5, Breaking Point, and Three.